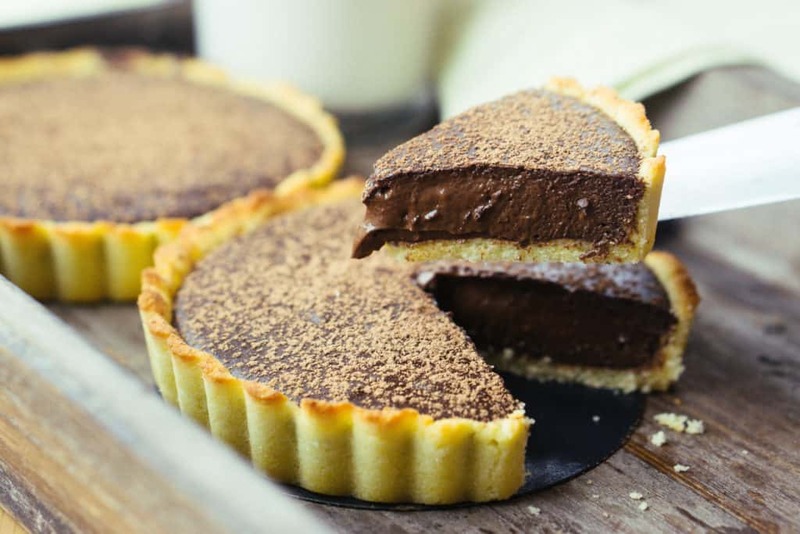 We have been lucky enough to eat this incredible, low carb, Dark Chocolate Tart recipe in our lives twice so far. The first time was when Matt tested this recipe out and it came out perfect. We instantly fell in love. The second time was for the video and we didn't have the heart to throw any away, so we ate both. Now only if we can find a third time to make these without for the simple fact they are the perfect dessert, we'll feel less bad about consuming so much chocolate tart in one months time frame! When I hear the word tart the last word I think of next is easy. Tarts have never seemed easy to make and I've never even wanted to take on the task, so this was all Matt. He was actually excited to try it out and for good reason - they are delicious beyond words can describe. He nailed it, and with such ease. The entire process of making these tarts start to finish is a lot simpler than I would have imagined and now I would feel comfortable making them weekly or for a house of guests! Most of the hard work is done using the immersion blender and chilling in the fridge. Exactly as I said before - easy. Fancy Dessert Recipes That Are Easy To Make! After running a food blog for two years we've found an expertise in making desserts that look super fancy, but are easy to make, including this tart recipe. Some others that may fool you are our coconut cream pie, maple bacon custard and low carb cinnabon donuts, and all three are hands down must trys! We assure you if we can make them, and we have no baking experience prior to starting our food blog, than you can too! Also, most if not all our recipes normally have a video that shows you step by step exactly how to make them! 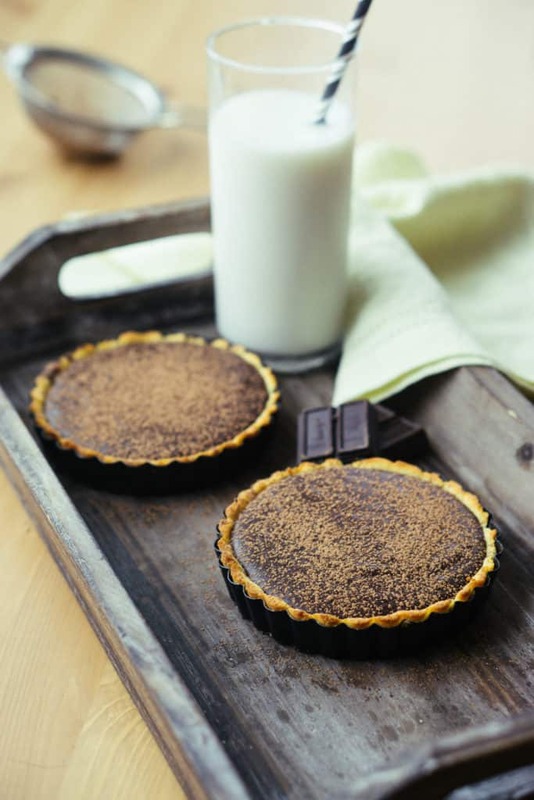 Whether you are a lover of dark chocolate, milk chocolate or just a plain old lover this tart recipe is going to become your newest love interest! Though it is labeled a dark chocolate tart, and we use 100% bakers chocolate, you shouldn't shy away just because you aren't a dark chocolate fan. The combination of the light coconut flour crust with the rich chocolate filling makes this the perfect dessert for everyone. You can even top the dark chocolate tart with some sweet whipped cream to help with the dark and rich flavor! We use two 4-inch tart pans for this recipe! 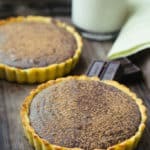 Recipe can be quickly added to MyFitnessPal - Search "KetoConnect - Chocolate Tart"
Make crust: preheat the oven to 350 degrees. Combine all the crust ingredients in a small mixing bowl using a spatula. Divide the crust mixture amongst two 4-inch tart pans and mold to the pan using your hands or the spatula. Push the crust mixture up the sides of the pan. Poke holes in the crust using a fork and bake for 10-12 minutes, until the edges have slightly browned. Allow to cool while you make the filling. Make the filling: heat the cream in a bottom heavy pot over medium heat. While the cream is heating, finely chop the chocolate. Once the cream has heated through pour it into a narrow jar (that will fit an immersion blender) or a large measuring cup. Add the chopped bakers chocolate and blend with the immersion blender. Add the cream cheese, egg, erythritol, and stevia and blend until smooth. Divide the filling mixture between the two crusts and bake for another 15 minutes. Allow to rest for 30 minutes and then refrigerate for 1-2 hours to fully set. Before serving, let it rest on the counter for 10 minutes.